Panamint City, Death Valley, CA. 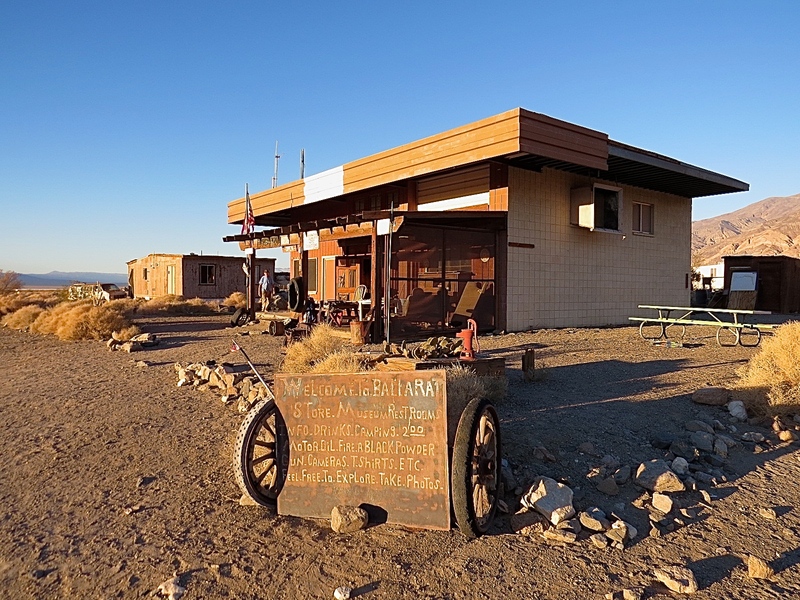 Panamint City is a ghost town deep in the Panamint Mountains of Death Valley. It’s historic, well preserved and hard to reach. More than 130 years after Panamint City’s peak as a silver boomtown, it looks a lot like a post-modern apocalyptic summer camp. Abandoned cabins, trash sculptures, mining tunnels, colorful, rotting cars and a hillbilly hot tub MacGyvered from a bathtub and fire pit are tucked into a narrow enclosed valley. The hike is a tough one with a 4,000-foot elevation gain and rock scrambling. The trail follows pieces of the old mining road through Surprise Canyon. Surprise Canyon is a destination in its own right. The surprise here is all the water you encounter just a few miles from harsh, open desert. Surprise! It’s a green canyon wonderland. Dazzling white stone walls and a sparkling creek contrast with the lush greenery. 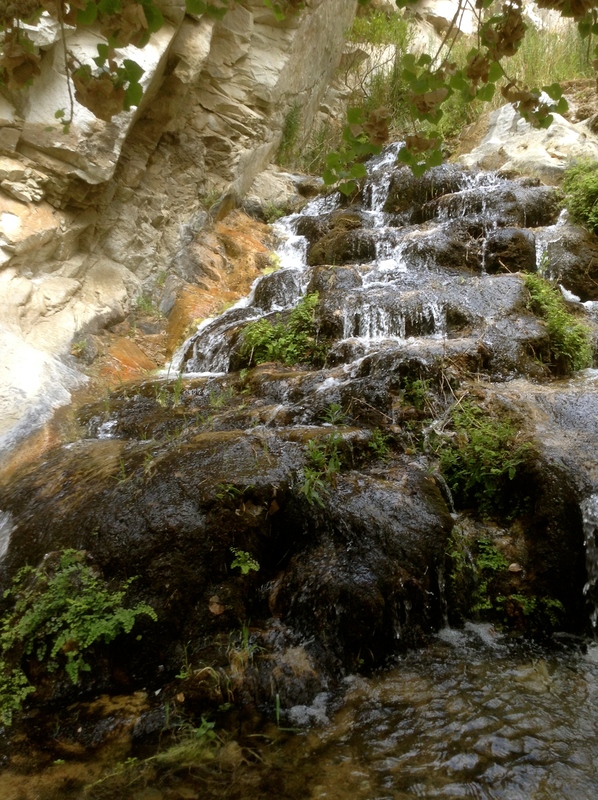 The creek tumbles into waterfalls and pools that are deep enough for a dip. At times, the hiking trail is the creek. On a blazing hot day at the end of May some friends and I met up at the almost-ghost town of Ballarat to start our backpacking adventure. The town is surreal. It rises from the dusty, mirage-filled Panamint Valley floor in a permanent golden nostalgic glow. It’s unexpected, dwarfed by the mountains. Ballarat was a supply center for silver mines and camps in the early 1900s. Its more dubious claim to fame is hangout for the Manson family in the 1960s. Their ranch was nearby, and their old truck is parked in town. Rocky Novak, the self-appointed caretaker and lifelong resident will be happy to point it out to you. As the only full-time resident, he saves Ballarat from being a full on ghost town. He watches over the historic ruins and keeps an icy cooler for travelers, stocked with beers and sodas, in the old general store. Rocky can give you the history of the area, tell you about road conditions and give insider tips before a hike. Stopping in to say hi is the first step for any trip. As we hiked through Surprise Canyon we found and lost the old trail. We bushwhacked our way through the creek. We climbed over waterfalls. We pulled out rock climbing maneuvers we didn’t know we had. We wondered how a road ever came through here. In Surprise Canyon it’s easy to lose track of time and distance. Hiking guides list the trek to Panamint City at five miles, but it’s easier to think you’ve gone farther than you have. It’s the other surprise of Surprise Canyon. You think you’ve gone 10 miles, but it’s only been two! A few hours in we thought for sure we should be there. 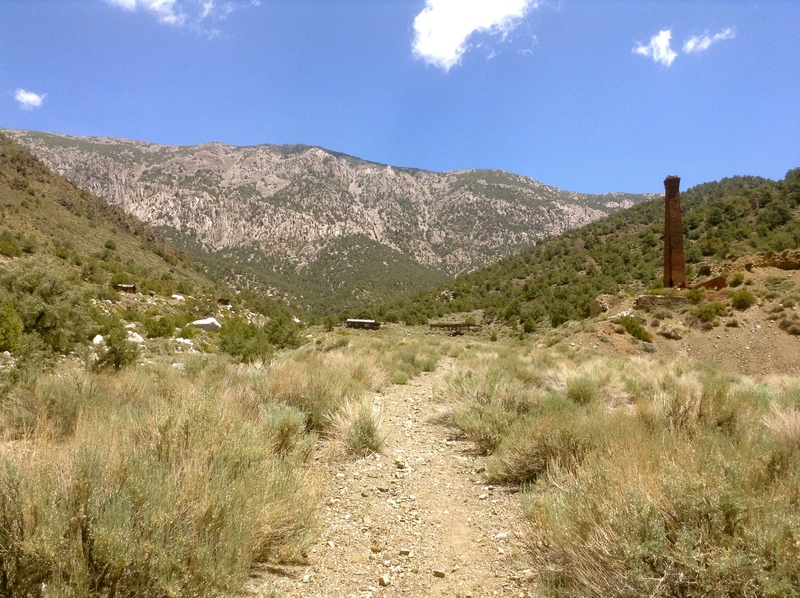 We became convinced we had wandered up a side canyon, lost the trail completely, or somehow walked right past all the huge ruins of Panamint City. Note: none of these things are possible. Panamint City was nowhere in sight, but we were tired and ready to set up camp. We stumbled onto a kickass campsite. The flat rock platform with a natural stone fireplace was our home for the night. We woke up to a lone hiker trekking past our camp at a brisk clip. We asked him where he was headed. Um, Panamint City? In the cold light of morning our wild speculation from the night before fizzled. Soon we were packed up and hiking the final mile along the old mining road, obvious, just past our camp. Apparently we needed the tourist hiker from Idaho, with the same guidebook and topo map we had, to set us on our way. We didn’t mention the fact that I’m writing a guidebook to Death Valley or that my friend is a seasoned backpacker who had solo-hiked Mt. Whitney, the highest point in the contiguous US, the year before. Pretty soon ruins started appearing, a brick smokestack in the distance, stone foundations, mining tunnels. Panamint City! Scenic, well-preserved, well watered, and forested with Junipers and Pinyons, there are cabins, a mill and artifacts for days. 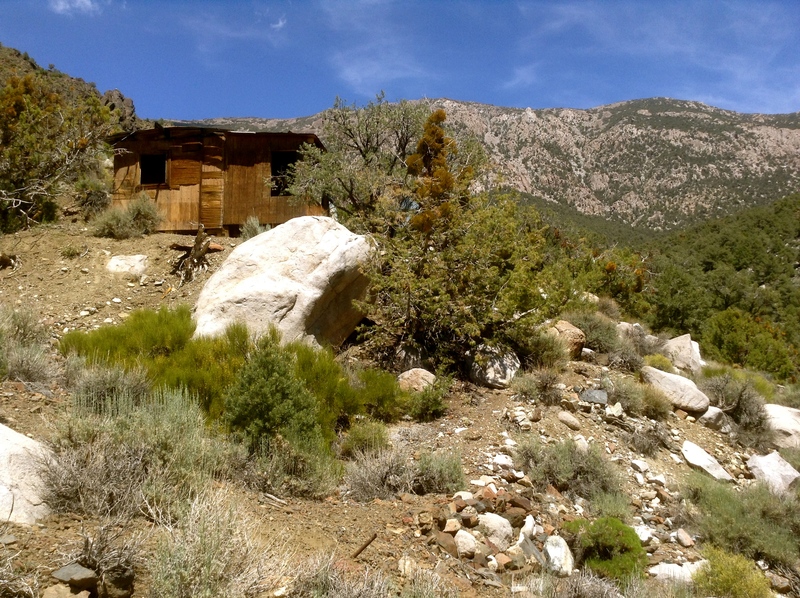 Hikers have dubbed the biggest cabin the “Panamint Hilton” because of its running water and glass in the windows. Rusted wind chimes dangle from the porch, fashioned by creative hikers, whittling away the time, new sound from found junk. Sourdough Canyon stems off to the north just before town and has a cabin and its own surprises. 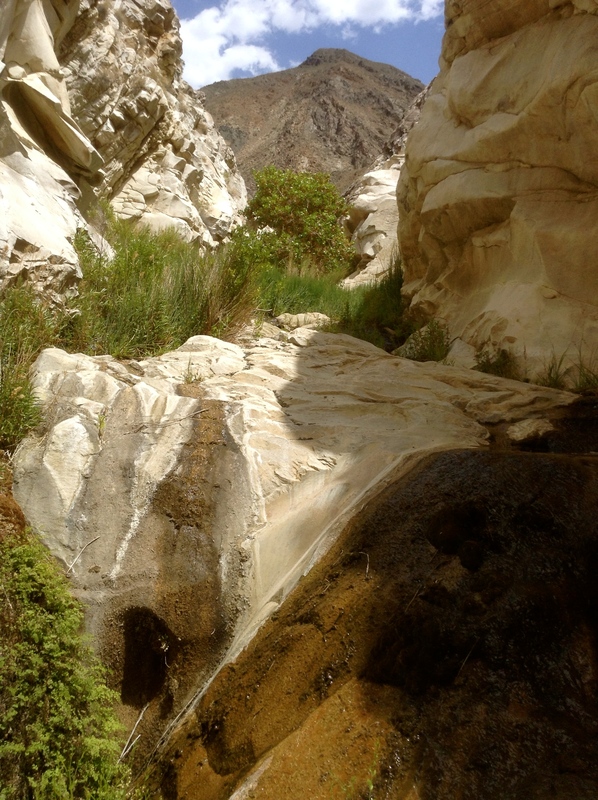 Water Canyon just beyond Panamint City has an old camp and a running creek. An abandoned 1957 Chevy proves that there used to be a road. 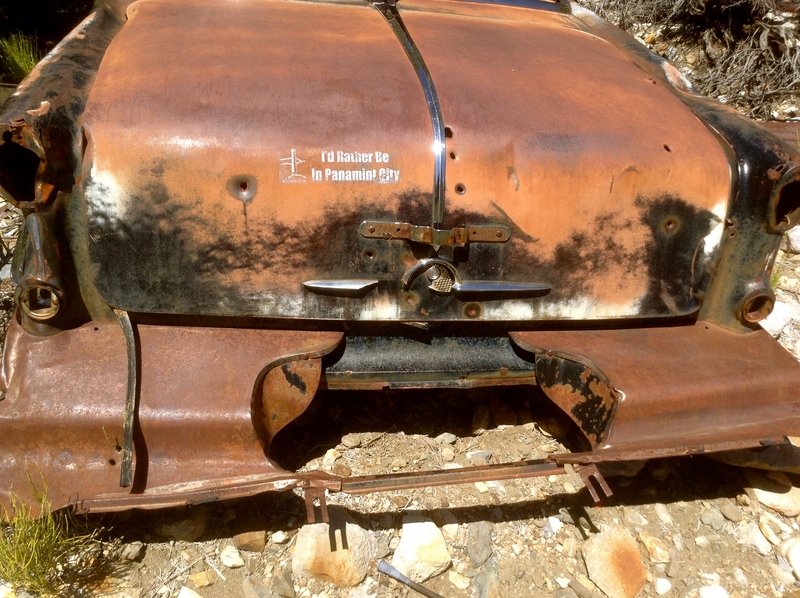 It has a bumper sticker that reads: I’d rather be in Panamint City. The way back was a lot shorter. We took time to dip in the clear mountain pools and take pictures, but we kept up a good pace. We knew the coldest beer in Ballarat was waiting for us at the general store.